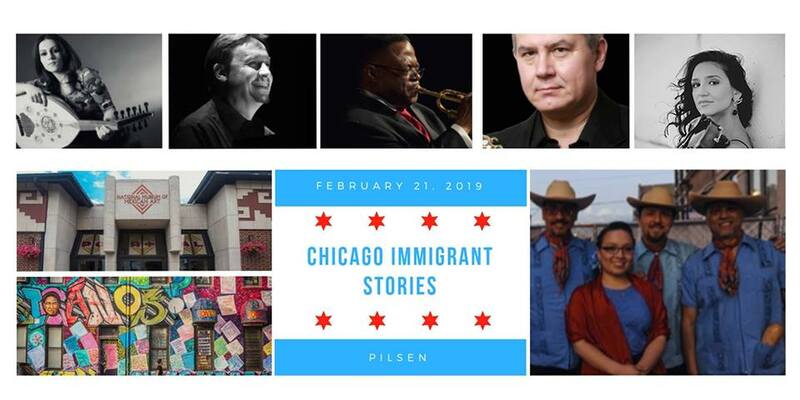 Sones de Mexico Ensemble’s Juan Dies, Victor Pichardo, Eric Hines and Erendira Izguerra join forces with Orbert Davis and the Chicago Jazz Philharmonic to explore the Mexican experience in Chicago through a jazz perspective at the National Museum of Mexican Art February 21. CJP’s artistry of cross-genre collaborations will meld with the musical culture of some of Chicago’s immigrant communities, in a series of small group “Innovation Lab” workshop performances that will culminate in a large orchestral event at Millennium Park in Summer 2019. The collaborations will be led by Orbert Davis working with select musicians across the city, and supported by CJP orchestra musicians including Leandro Lopez Varady (pianist from Argentina), Zara Zaharieva (violinist from Bulgaria), and Suzanne Osman (oudist and percussionist from Lebanon). Join us for this one-night-only event to witness jazz, classical, and diverse music of the Mexican ‘son’ tradition meld and connect in new and unexpected ways. The musicians will share their stories and their music to create a shared experience of what it means to be a Chicagoan and an American. The National Museum of Mexican Art will be available for self-guided tours prior to the performance.